Oenophilia (pronounced /ˌiːnɵˈfɪliə/ EE-no-FIL-ee-ə), originally from Greek, is the love (philia) of wine (oinos). An oenophile (/ˈiːnəfaɪl/) is a lover of wine. I absolutely love glassware; I try to keep a collection of glasses for every use: red wine, cordial, brandy, white wine, and the list goes on. However when I come home from a particularly long day at work and I want to treat myself to a little Chardonnay, I have my own glass, to which it belongs to no set; all mine! I highly suggest endulging in this most oenophilic luxury. And if you can't keep your nose out of the decanter, then you have to have a glass (or six) from Mimossa Studio. Oenophiles are lovers of wine. My name is Janitza (Jani) Macleay and I was born and raised in Puerto Rico. In 1989 my family and I moved to Virginia, where I met my husband. Due to his job we moved quite a bit and I spent that time raising my 2 beautiful girls. I have always enjoyed working and creating with my hands, from cake decorating to mosaic tiling. After almost 10 years of moving, from Colorado to Texas, we got an opportunity to move back home to Virginia. Working on anything crafty took a back seat for a while, but now that my kids are getting older I found myself wanting to do something that I enjoyed for myself, and that's how Mimossa Studio started. Ever since I was a kid I always loved working with my hands, from cake decorating to flower arranging, you name it, I have tried it. About a year ago I started painting on on Christmas ornaments and then decided to try painting on wine glasses. At first the results were not good but I kept trying and long and behold I fell in love with painting on glass. The thing I love the most other than being my own boss, is the designing and creative part of painting. I get excited when someone wants to order a glass for a friends birthday, anniversary, bachelorette party, etc. and they are not sure what they want, because it gives the opportunity to design something just for them. Don't get me wrong, if somebody has something specific in mind I have just as much fun! I know that every where you turn there's a display of hand painted wine glasses and they are beautiful but I like knowing that when people buy one of my glasses it's designed specially for them, no two are ever the same and in a way I get to be a part of their special moment. This glass keeps your eye on the prize. Want your craft to be featured here? Email us at dccraftmafia@gmail.com! It's been nearly six years in the making, but Happy Heads, DC is preparing for its first real event, thanks to the Mafia! Happy Heads, DC is a simple idea...use your crafty yarn-based energy to make hats and fun winter garments for kids in DC who don't have appropriate cold weather clothing. The program works through Safe Shores - the DC Children's Advocacy Center (CAC). The CAC conducts forensic interviewing of children of suspected physical and sexual abuse in the District. We're going to meet August 22 from 12-5 pm at the *AWESOME* Stitch DC near Capitol Hill in DC. Come to meet and talk crafty talk with the Mafia, get knitting/crochet tips and participate in the program! Just bring a small donation of school supplies, new child's undergarments or other items on the CAC's most wanted list (more to come before the event) and make a promise to donate a new, handmade hat or winter garment to Happy Heads, DC later in the fall. That's it! We'll have a few cool give aways and snacks galore! Want to help? We'll need ideas for give aways, bloggers and local press folk to help us spread the word and promote the event. Leave your thoughts in the comments and I'll be in touch. Special thanks to Marie at Stitch DC for hosting! Ballston A&C Market This Saturday! Holy Craft--The June Market is tomorrow! Awesome. Swing by Welburn Square from 10:00am - 4:00pm to meet brand-new artists, like Moonlight Bindery, Glynt Pottery, Holland Cox, Yinibini,Space Moderne and popidiot. And say, "hi," to your favorite retuning artists, Melissa Lew, Steven L. Miller Words & Images, Phil Barbato, BoxBoy Demented Decoupage and many more. And of course some of the Craft Mafia members will be there representing--Ninnycat Crochet & EHL Creations. You may even see a piggy bank or two from This Little Piggy. The talent's off the charts. And that's just a taste who's joining us in Ballston tomorrow. It's gonna be a gorgeous day, so stroll through the Square. 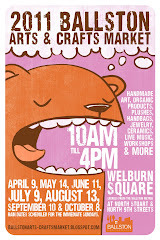 We'll have tons of crafts, demos, and froyo (Sweetflow Mobile!). A good time is practically guaranteed. Call for Crafters: Demos Needed! The Fenton Street Market is looking for crafters who want to show off their talent! Are you a crafter that loves to be in the spotlight? Do you love showing everyone how it is you do that crafty thing you do? Then contact Deb at the Fenton Street Market to find out more about demo opportunities! For the Saturday 26 June market, we would love to find crafters who use upcycled/repurposed materials for their work! *Crafty business fact: opportunities to demonstrate your work help to promote your business and create great networking relationships in your local craft scene! Meet Cassey, the talented and fun crafter behind Casstasstrophe ! I was born and raised in Iowa but spent my early adulthood traveling the world while doing a tour in the Navy as an aviation hydraulic mechanic. Although I've always considered myself creative and artistic, I ended up getting my degree in Engineering and moved to DC a few years ago to work for the government. Although my professional life is spent behind a desk as a drone, my free time has always been dedicated to crafts of one form or another. Sometime last year I came across a ton of shrinky dinks and I have been experimenting with new ways to use this extremely versatile medium. I started a collection of shrinky dink pendants which were decoupaged with beautiful Japanese Washi Paper. With the wide varieties of washi paper and the versatility of Shrinky Dinks, an endless possibility of pendants could then be created. I then experimented with painting Shrinky Dinks. When I found that using acrylic paints worked really well, I realized that I could then focus on intricate cuttings of the plastic. The effect was amazingly detailed silhouettes that would be nearly impossible to achieve else wise. Being a science fiction geek, my Star Wars collection was born! I have plans on bringing out a classic arcade collection this Summer which will include Pac Man, Donkey Kong, and Super Mario Bros. as well as some science themed ideas which will follow soon after. As a proud self-described geek, I always struggled to find accessories which would proudly declare my geekdom with out being too kitschy. I feel that my jewelry really fills a need for classy geek-ware accessories for women. I know that classy geek-ware sounds like an oxy moron but just because I'm a nerd doesn't mean I don't have style! Other examples can be found at my etsy shop! Thank you for allowing me this opportunity to share my crafting with you! I hope that I can inspire other crafters to experiment and use well established crafting mediums in new and innovative ways!